We welcome Meagan Harris with End the Mommy Wars’ inaugural guest post. When I asked moms on our Facebook which topics were most debated in their social circles, I was baffled at the diversity of the responses! Meagan’s is the perfect first post because it addresses one of the more unusual of the mommy wars topics. What speaks to me most about this particular issue is the fact that it is an issue in the first place. I believe that the fact that mothers are willing to judge and battle over such a very personal, and in my opinion very seemingly innocuous, nuance of family life is evidence of the depth and breadth of the mommy wars. Before I had my son, I had no idea that there were so many things that I needed to worry about. Eight months into motherhood, I’m still learning. Sometimes things that I consider benign or unimportant can turn out to be some of the most hotly debated topics in the mom community. Today I learned that one of these topics is whether or not to tell your kids that there is a Tooth Fairy, Easter Bunny, or Santa Claus, etc. Silly me; I just assumed that people either told their kids or they didn’t. I thought that if you didn’t want your kids to believe in the Tooth Fairy, it was no problem. That if your kids do believe, you know that at some point they will learn the truth and you’ll find a strategy to deal with it at that time. To me, it’s no big deal. Wrong, folks. It is a BIG DEAL. Today on one of my parenting Facebook groups, the moderator asked if people were planning on telling their kids that there was a Tooth Fairy. And all hell broke loose. The snapshot that I posted above is just a snippet of the comments posted. As of the time that I last checked, the post was 50 comments strong…and still growing. 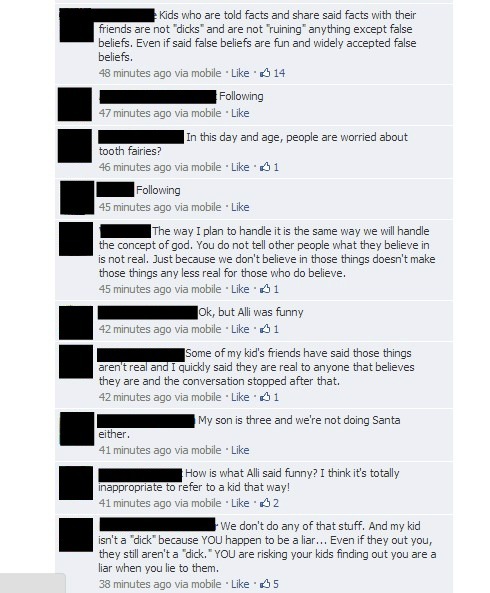 The debate started when one parent wrote that she didn’t want her kid “to be one of those dinks who tells other kids that there is no Santa”. Sanctimonious moms everywhere hopped on board to tear her down. To be fair, I don’t agree with her use of language, and I don’t think it’s fair to blame kids for what they say to other kids. But the replies are so nasty, labeling parents who let their kids believe in the Tooth Fairy as liars and and accusing them of deceiving their kids. Which, of course, prompts a defensive backlash from that group of parents, claiming that at least they let their kids be kids and live with a child-like sense of wonder. I don’t mean to make light of this issue. There are obviously people who feel strongly about it. I’m just genuinely surprised by how passionately people argue either side. At this point, I honestly don’t know if we’re going to have the Tooth Fairy and Santa in our house. If we do, I don’t believe that it will cause my son irrevocable harm when he finds out the truth. I don’t think that it will forevermore take away his ability to trust in people. If I choose not to, it wouldn’t be out of a desire to crush his spirit and rob him of his childhood. Either way, this is one of those decisions (like most parenting decisions), that really only matter to me and him. As parents, there are so many important things that we can focus our energy on. Do we really want to argue about what stories someone else is telling their children? Meagan is a writer, aspiring editor, and amateur baker. She lives in Coquitlam, British Columbia, Canada with her partner and baby boy. You can join her on her journey through motherhood on her blog, The 80/20 Mom at the8020mom.wordpress.com or Twitter at @megbo_meggins. I didn’t want to teach my kids about Santa because I feel it detracts from the religious aspects of Christmas but it is so pervasive that they learned about it in school so we half heartedly started it. Santa only brings stuff for the stocking though, I don’t want him to get all the credit for the cool gifts. The Easter bunny is not a thing at my house but the Tooth Fairy was very much treasured until my middle son found the stash of teeth in my room and ruined it for everyone with his big mouth. I was very glad to contribute this piece to a new blog that’s a project to encourage moms to be kinder to each other. This post was the first of a series on subjects that are contentious in the parenting community. This is so important. I cannot believe how mean moms can be to each other. I am glad that I have a supportive group of moms in my mom’s group (who knows what they might be saying about me behind my back haha) and a great blogging community on line. Thank you for this post. I had no idea what I was in for!! ← Does Research on Parenting Outcomes Help or Hurt Moms?